Any plans to repress this on 7"? Hey John -- Thanks for the heads up! The tracks must have been deleted by mistake. Everything is now back in order. 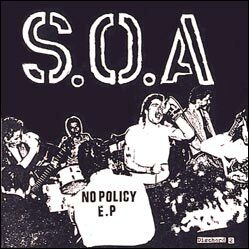 Aren't there 10 tracks on the No Policy EP? Why are there only 6 tracks listed? Ten songs by State of Alert, released in 1981. This 7" EP is out of print. However, these songs are available on the 1981: The Year In Seven Inches CD, The Four Old Seven Inches LP, and here as MP3s.